Yes, this is my first app in google play store. I created it my own needs. It's simple app which helps to recommend a credit card for use on a particular day. Multi device cloud sync using firebase database. 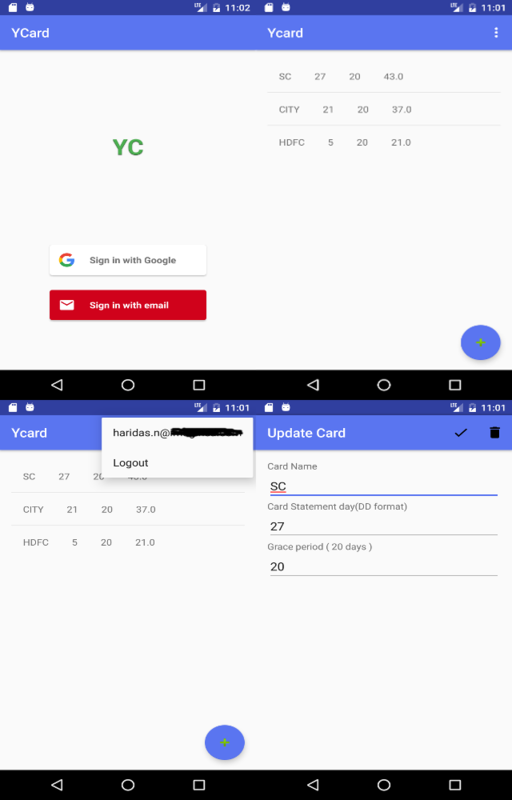 Easy way to add new card with Card Name, Billing day (eg: 04, if the billing date is 04/April), and Grace Period ( How many days you get between bill generation date to actual bill payment date, generally this is 20 days). Currently the card suggestion is based on the grace period details that we enter when we add new card. It checks; for each card, how many days are there before the card bill is generated. For example, assume today is 6'th of a month, then we have to pick the card which gives best score based on the following calculation. ie; score = 30 + 20 = 50 (This will vary slightly due to varying number days of each month), and note that this is best score of a card based on the above given values. Assume today date is 21'st, we want to pick a card, for that card, the score is = (05 (next month) - 21) + 20 = 14 + 20 = 34 days. In ideal case we can maximize this if we made the purchase on 05'nd of the month using this card. The app is just doing this and displaying the card after sorting it out based on the score of each card. Display the card with more images and details. Methods to improve the offline usage. If you guys interested, give a try and let me know your feedbacks.